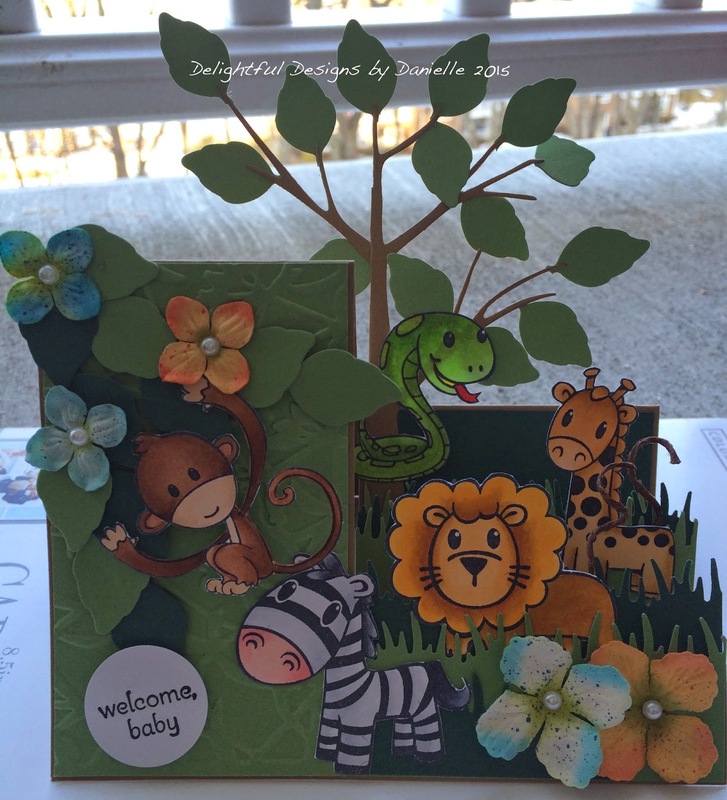 Delightful Designs by Danielle: Welcome to the jungle .... baby! I am so excited to be back today with this super fun card I made. I was asked to make a baby shower card where the nursery theme is jungle animals. I knew exactly what stamps I wanted to pull out but it took me a while to find my mojo and get inspired! Then, it dawned on me ... a side step card is the perfect solution to creating a 'scene card' when needing to incorporate lots of animals! And so here is the result ... after many hours of colouring, cutting, embossing, punching, glueing and assembling! I am in love with it! I can't even begin to tell you how happy I am with the end result. My friend is thrilled too and absolutely loves it! Stamps are PaperWorksCo (retired), coloured with copics. Grass is MS border punch, embossing folder and leaves are Spellbinders. Flowers and pearls are from my stash. Sentiment is SU! Thanks for stopping in and I hope you enjoy viewing my card/make as much as I enjoyed making it! Appreciate all your comments - thank you! Enjoy your Wednesday! Wonderful idea, Danielle. Perfect for the PWCO critters! Wow...this is such a cute idea! I love all the detail Danielle! Perfect card!!!! Wow, not surprised this took ages to make ... bet the parents were absolutely delighted!